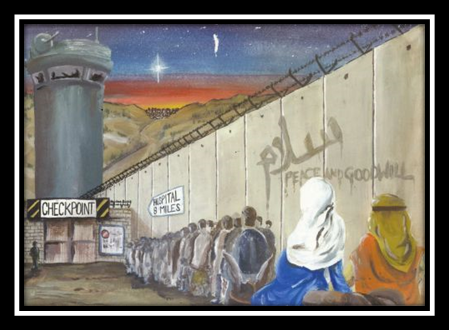 As the world prepares to mark the birth of the greatest Palestinian of all time, I wonder what Bethlehem was like at the time of His birth. Well, it was under the oppressive regime of King Herod, ‘client’ king of the only superpower of the time, Rome, which wanted to retain control of Palestine because of its proximity to Rome’s two resource rich domains – Syria and Egypt. Not much changes in a mere 2000 years, does it? In my quest for a present day resident of Bethlehem, I came across Anton Murra, a Palestinian Christian and writer specializing in interfaith dialogue, Israeli-Palestinian peace initiatives and multicultural understanding. Instead, the plight of the Palestinian Christian is very much connected to that of the Palestinian Muslim in that both experience injustices every day as a result of oppressive and discriminatory policies imposed on them by the Israeli Occupation. Bethlehem is about six miles (10 kilometers) south of Jerusalem. Although only about 20% of Palestinians in Bethlehem are Christians, Christians and Muslims in Bethlehem have been living together for centuries. They are neighbors, friends and classmates. Both have suffered from the Israeli occupation for over sixty years and both have showed steadfastness in the face of oppression. Murra goes on to elucidate the responses he got to his question: What do Palestinians want for Christmas? … Some people mentioned spiritual gifts like love, faith and hope… Other people wished for the end of the occupation and freedom for Palestine. These people have suffered tremendously from the Israeli occupation… Like those who wish for world peace, these wish for peace and justice for the Palestinian people. They are not activists nor are they affiliated to any political group. They are simply ordinary people who are frustrated with the Israeli occupation and consider it the source of hatred and evil. Roger Salameh, a 27-year-old Palestinian from Bethlehem, argues ‘for us to live in peace, the occupation must end.’ His Christmas wish is for ‘a free country recognized by the world.’ Another group of people wishes for a better life situation for themselves and for their relatives and friends. Others wish for food security, health, jobs and reconciliation with their relatives and neighbors. They want to challenge the depressing reality that surrounds them and live lives despite all the odds. I myself have been experiencing the Israeli occupation all my life. I’ve heard people talking about peace and justice since I was a little boy. A lot of people were lost struggling for peace and justice. I have been actively working towards achieving peace and bringing justice for the Palestinians since 2000. I haven’t given up hope and I will keep working to bring about positive change. So as you rush around to fulfil every little Christmas wish of those near and dear to you, what will you do to help Anton Murra and his fellow-Palestinians to fulfil their dreams? Previous Post Shanghai, Hangzhou and Woman Power! 100% correct Jesus was a Palestinian Jew not a Israeli Jew!